The Cure Brain Cancer Foundation is Actually Doing It! Through a new kind of Hackathon, called SW/TCH. I spent the morning with CEOs and CFOs from various ASX listed companies ( ANZ, PwC, Johnson and Johnson, WSD:Au ie Westfields) hearing about the Cure Brain Cancer﻿ Foundation and how it plans to expand exponentially and deliver outcome in a new "disruptive" way! Brain cancers still have some of the worst outcomes of any cancer - with glioblastomas, the most common form, having horrible 5 year survival at 5%. To put that in perspective, my cancer, AML, is the worst leukaemia, and I was given 10%, with a chance of a cure.. In other words... compared to many, I was lucky. Brain cancer is the number 1 cancer killer in children, and in women under 39 and men under 45. They cost the most of any cancer to the public, have the highest rate of Years of Life Lost (YPLL) and get a tiny chunk of funding despite this (3% of the NHMRC). Why? Because despite the fact that it's a huge burden to the economy and that it affects a lot of people, brain cancers aren't as common as others. Because there are some major challenges to delivering treatment to the brain that makes surgery the only viable option right now. And because people who have it die too fast. You'd think they'd all be reasons to fund it more, eh? Well, the Cure Brain Cancer Foundation is hoping to fix that. And they're doing it in a revolutionary way. They plan to not only raise $20million over the next 3 years and bring the 5 year survival up from 22% (remember, the most common form has a 5% 5 year survival) to 50% in 10 years; they plan to disrupt and revolutionise the very way in which research is done by ALL organisations. And their goals, in a global consensus, are actually considered extremely achievable because of it! All from 1 research organisation, based in Australia, alone. That's amazing! 1) They're making all research patient outcome centered and only funding research that'll likely make a difference in the clinic and ones that'll make clinical trials. 3) They're ensuring collaboration and maintaining an open research model, similar to Harvard's, which will eliminate duplication in research. Today, often teams of researchers are working on the same problem without even knowing they are - wasting millions of dollars and valuable research time Indeed, a friend of mine found this out the hard way. After years of research was nearly completed and ready to be published, she found another team had published exactly what she'd been working on mere months before hers was ready! They're changing the way they're doing their research. A video giving an example of a process which may allow us to reverse engineer cures! 5) They're looking at the rare long-term survivors and seeing why they survive, eliciting what factors or what innate property about them allowed them to make it that far and seeing if they can replicate it in others, not dissimilar from the method I talked about a few blog posts earlier. 6) They're actually funding clinical trials. Meaning they're REALLY committed to getting medicine to the patients. All of this makes them a world leader. Their aptly named "disruptive" research model will revolutionize the way research is conducted by charities, governments and corporates. And, disruptive as they are, they didn't just highlight what made them a very worthy charity to this gathering of CEOs, CFOs and other 3rd level corporate executives while putting a hand out, asking for money. They made it a win-win. They gave their potential corporate partners there a way they would benefit too. They made it something that every ASX listed executive there wanted to get involved in. Something, I'm sure many of you know, I strongly believe in. And because of that, they will now have made their funding model self-sustaining. So what is this exciting new event they're running? Silicon Valley houses international powerhouse companies like Google, Cisco, Apple and Microsoft, and thousands of other, often billion dollar businesses follow to keep up. People call it the technological hub of the world. But it's really not. As Mark Zawacki, the keynote speaker, and founder of 650Labs, put it, it's the disruption hub of the world. The open collaboration between huge companies of various industries and sectors, combined with innovative, young minds results in new ideas old, clunky, big corporations simply can't keep up with. It's the reason why the Silicon Valley produces 4,000 new companies and start-ups every year. The world has changed. The millennials (1990s-2000s born an onwards) of the world are hitting the market, and they often don't hit up stores and malls to get what they need. The internet, 3D-Printing and freer markets than ever before have allowed more flexability than ever before, and more and more, new players are coming in, starting up and filling niches at a rate corporations and big business simply can't keep up with. And often, it's these millennials that ARE those new players. They're swaying away from big corporate. They're cleaning up. And they will be for the next few decades. More than ever before, there's a need for new ideas, new strategies and innovation for big business. Some of you may have heard of "hackathons". Basically, they're competitions, run often on weekends or day offs, where hundreds of computing majors, graphic designers, project managers and the like get together and compete to solve problems through software, apps and the like. They're used as team building exercises, ways to get ideas flowing and just fun outlets for the competitors involved. And indeed, these hackathons put young, bright minds to the ultimate test... but as they grew in frequency and size, corporations realised their value. The weekends and events are now intensely scrutinized by companies, managers, CEOs and the like; indeed, nowadays, most are sponsored by corporations such as Microsoft, Heinekin and TomTom (a few of the sponsors of the Dutch Open Hackathon). And the winners of these events not only get generous cash prizes, but often have their software, apps or ideas pursued by big corporations, or else go on to pursue them themselves and they have their skills broadcasted to HR departments from large corporations/businesses all over the world. They get fresh ideas for big corporations and new players alike. But where these hackathons often fall short is their ability to produce marketable products. And though they're encouraged to design new ideas, new ways for businesses to make money, the end goal is the actual software and presentation. Ideas are inferred from these. Well, Cure Brain Cancer is putting on an "idea-athon"
And the event's name is SW/TCH. Instead of focusing solely on developing software and writing code, competitors will be encouraged to design solutions for problems. Code may or may not be required, but the corporate sponsors of the event will be able to bring real, broad, overarching problems their sector has in delivering services/products to the table as the challenges for the idea-athon. And a real focus is being put on encouraging inter-sector cooperation between businesses, similar to the way Google and Amazon are combining the mobile operator, transport and retail sectors to deliver groceries to people's doorstep. They're selling sponsorship of the event $100,000 a piece and are planning on having 5 - 7 ASX listed companies, or large private corporations, from each of the different sectors represented and sponsoring teams. These corporations would have the opportunity to observe the idea-athon and can walk away with ideas to take back to their industries. And as for the benefits to uni students - there are cash prizes for the first few. HR departments from the top firms and companies will be there in force, looking for talent. And - best of all - first place gets an exclusive tour of Silicon Valley, being invited to the innovation centres of Google, Microsoft and other international giants, as well as being invited to silicon valley labs to develop new ideas and network. Everyone who competes also has the opportunity to develop their idea into a product. All of that on a fun weekend. I've got a team - any student reading this - form yours too! It's definitely a great opportunity. For Cure Brain Cancer, for uni students, and the corporations alike. There were already expressions of interests, and one on board, on that morning. And for a weekend of innovation on this scale, more will have been made after that, that's for sure. Companies were really interested and keen on the idea, but so were government representatives who wanted to partake in observing this, and were offering up data for the events/outcomes of the events too (crucial to success). Mark Zawacki is a genius. And this idea to both help the business community, raise awareness and funds for brain cancer research and make Sydney an innovation hub; something that'll benefit the whole economy, truly encompasses Cure Brain Cancer's Disruptive approach that is already making waves. I only wish I was a grad student, so I could compete. Zawacki was asked if companies and corporations could pay to have observers at the event, at a premium of course. And he was almost agreed to that idea. It's great that people want to get involved, and understandable that they wouldn't want to take the risk of spending $100,000 in its first year alone. But observers may undermine the whole purpose of it all, giving the corporate sponsors a chance to take ideas home for them to execute upon if wanted. It may shy away a few potential backers. One question asked was how should companies get more of this innovation and cooperation between sectors happening without these hackathon style events as catalysts. Mark answered that in the future, hopefully this collaboration and innovation will be natural. This questioning of assumptions, and long-standing practices in business should also be questioned. And I agree with him on that. Why not help foster it more? Simply fostering interaction between innovation departments in large corporatons of varying sectors would be a simple, yet effective way of getting more ideas, that can potentially convert into money, happening. The silicon valley exists as a physical space for minds to interact, but in this internet driven world, that physical interaction isn't necessary, as long as they've had an opportunity to catch up. Ways you can do that similar to this idea-athon are to organise competitions where consulting firms, or specific sectors ask young innovators to push ideas for improving their businesses. Enactus for instance hosted such an event, held at the University of New South Wales asking participants to deliver ideas to improve business models, or functionality of social enteprises this year, and many social enterprises were in attendance, hearing 50 detailed, well outlined ideas. As you can tell - I found it really interesting and very exciting. I was expecting the event to be extraordinary, as I'd read about Cure Brain Cancer's unique research model. But seeing them convince corporations to get on board in THIS manner, by giving them something in return, was truly amazing and really interesting. I also got to get in contact with many people from various big pharmaceutical developers which'll help me in writing my book on how to make it all more efficient. And I also got to tell my story to some damn amazing people. Which is always cool. "How could you do that? I'm not gonna donate to you!" But then I started telling her why. But when we look at figures in the developing world... the inequality becomes even more shocking. 1/7 girls in the developing world will be married before 15. 1/3 will be married before 18. And most of those married young are poorer. Girls who give birth before 15 are 5 times more likely to die in pregnancy and birth. Complications from childbirth are still the number 1 killer in adolescent women. Worldwide, 50% of all sexual assaults are against girls younger than 15. That in itself is staggering... She agreed that it is. As I'm sure you do too. "But millions in the developing world are suffering. What will targeting One Girl do?" She's right. They are suffering. But improving the prospects of women in society isn't just great for women... it's great for everyone. Closing the joblessness gap between men and women alone would lead to a 1.2% per year increase in GDP for any nation. Countries who don't engage women in the workforce LOSE 27% of GDP per capita. Allowing women the same rights to access services and farm would lead to a 30% increase in their production. If this happened everywhere, we could feed 100-150 MILLION starving people! It's been proven that women, when raised out of poverty and earning, invest 90% of their income back into their family. It's a VERY effective way of not just one person, but a whole family and through them, a community. When we bring women to an equal playing field... we aren't just righting a moral wrong... we're doubling the workforce, and improving whole communities! "That still doesn't answer why you have to wear a dress though..."
Well, education is one of the best ways to both protect and empower women... and through them, their community - and ultimately, the world. When a girl in the developing world manages to get 7 years of education, she marries 4 years later and has 2.2 fewer children. For every year a girl stays in primary school, her income grows 10-20%. Every year completed in high school increases her income by 15-25%. Remember - most of that money goes straight back into the family and community! And in many countries in Sub-Saharan Africa... only 20% of girls get to secondary/high school. Only 5% complete it..
We can't turn back the clock... but we can change its path for many other girls. So why am I wearing a dress? One Girl, the organisation that produced that video, is trying to combat this issue. And their major campaign during the year is "Do It In A Dress." where participants are told to go around and do something; anything, in a dress. It's a great way of getting people to get involved, and hopefully, get this issue going viral (cause unfortunately, that's what it takes for people to take notice and give). One Girl fund girls through primary and high school, paying their school fees, giving them equipment and in secondary school, providing them with proper female sanitation (menstruation alone is why girls miss 20% of the school year - 50 DAYS. And teaching them hygiene at an early stage will improve their health for life!). It costs them $300 to put a girl through school! That's effective! 1/4 girls are marries before 15. 1/8 will die during childbearth. A girl born in Sierra Leone is more likely to be sexually assaulted than reach (not even complete) high school... That's some of the worst stats in a world. So that's why I'm Doing it In A Dress. Well - my team and I are doing this thing called Dares in a Dress. So every time one of you donates - you can dare us to do something... preferably something humiliating (though of course - not against the law or anything too incriminating)... In a dress. As a bonus - I'm putting up 3 extra-special dares as a bonus - at each "$300" mark, to celebrate the fact that YOU'VE helped me educate a girl! What are these extra special dares? At $300 - I'll ask a girl out while wearing a dress. At $600 - I'll do a full gym session... wearing a dress. 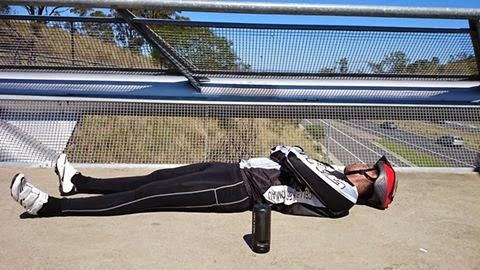 At $900 - I'll do the ENTIRE Sydney to Gong bike ride (90km, nearly 60miles!)... in a dress. https://www.doitinadress.com/nikhil-autar <-- So donate here! And feel free to dare me to do something when you do so! And as I mentioned - I'm doing it in a team! So if you donate here - or to all of us - you can dare us to do something in a dress... as a GROUP. I'm sure you can think of even more humiliation for us! Link to sources: Also a great infographic showing the issues women face around the world. This is why Tarini - A good friend who's also studying medicine - is doing it in a dress! Last post: My Story: Next One: I did it! Anyone who's had a cramp before knows how painful they are. Well... I've been getting one every day for the past 6 months. It doesn't just get me when I exercise though, it happens when I'm resting, when I'm driving... even while I'm sleeping. It can happen anywhere too. In my hands, making it painful to write. To my back, making sitting down comfortably an impossibility. To my chest, making me wonder for five minutes if I'm having a heart attack, my forearms, my abs; even my neck, making it hard to even breathe! But the worst one is when it happens to my calves and shins at the same time, making the only thing that relieves them, stretching, impossible. And when that happens, I'm stuck there, screaming for it to stop (sometimes in my head, often out loud), literally wishing for my limbs to be torn off or amputated; anything to get out of it! My doctors don't know why it's happening. Maybe it's due to low electrolytes... but the blood tests say they're normal, and supplementation hasn't worked. Maybe it's due to the steroids. Can't be that either; I'd been on or near 0 milligrams for most of those months. Maybe it's 'cause I'm exercising too much. But it happens on days I don't exercise too! Chalk it up to graft versus host disease, the remnants of my donor's bone marrows immune attack on my body, then... the usual thing they say when they don't have answers for it. I've tried everything to stop them. I've been taking magnesium, potassium, vitamin supplements. I stretch every day, and drink at least 4 litres of water. I juice, I'm on high salt diets - I've tried everything. And they STILL go on. ... So naturally, I decided to do a 200km bike ride. Well, to be fair... I didn't know they'd be going on this long when I signed up for it. But that doesn't really solve my situation does it? I make sure I'm hydrated and fuelled and I drink the highest electrolyte-containing sports drink possible but still they happen. Again, everywhere. And nothing is more scary than getting a cramp when you're at 60km/h on a downhill slope (that's about to turn sharply) and your feet are clipped in; unable to leave the pedals. And yet I'm still gonna do it. Why? 'Cause I'm sick of cancer taking so much away from me and so many others. I don't wanna feel held back by it all, I don't wanna see another stream of Facebook tributes for a person I'd met and helped through this blog and I don't wanna see another child lose their childhood to the disease. It ain't easy... But every time I hit a hill and my legs feel like they have nothing left to give, I think about the 4 lives I've changed through what I've raised already... I think about the people who've put hours, sometimes years of their lives towards saving me, and the hundreds of you who read this blog regularly and I know I've got heaps of people behind me in my quest to help others. And I think of the poor souls I've known personally who've lost their lives to this... and of how this will stop others from feeling their pain and loss. And that hill becomes that much easier. Me today, after 45 minutes of biking at a sprint... It's gonna be a LONG ride next week haha. Update: I've conquered it! I've done the 200km ride! Despite all adversity!